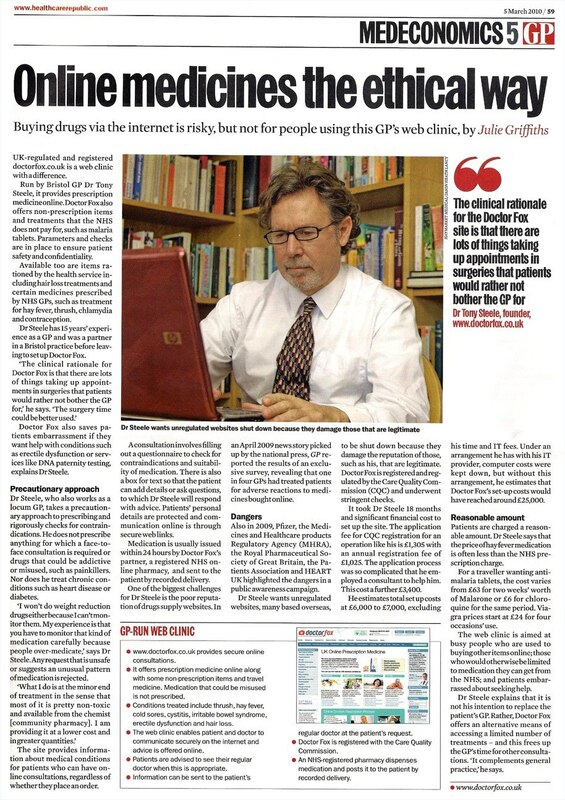 Dr Fox provides online medical consultations and issues private prescription. Prescriptions are passed to a registered UK pharmacy responsible for dispensing and delivery. Doctors provide advice before, during and after consultations. We provide medical follow-up after medication is supplied (contact details). If you agree, we keep your GP informed. Dr Fox employs General Medical Council (GMC) registered doctors most of whom are experienced GPs. See How it Works page for further information. The cost of medicine and postage charges are shown before ordering. There are no hidden charges. We are required under the Health and Social Care Act 2008 and GMC Good practice guidelines to inform patients of the cost of treatment before consultations. As soon as you have completed an online consultation you will know if you are eligible to place a provisional order. A doctor will normally authorise your prescription the same day. Medication is usually dispatched the same or next working day by recorded delivery. Prescription items are posted by recorded delivery (EU deliveries only). A signature is required on receipt. If for any reason the doctor does not agree to authorise a prescription, or an item is not available from the pharmacy, you will be informed by email straight away and a 100% refund will be made to your card within a few days. Unused medicine cannot be returned and should be given to a pharmacist for safe disposal. See refunds page. Dr Fox (Index Medical Ltd) is registered with the Care Quality Commission (registration number 1-101728017) and complies with the Care Standards Act 2000. Index Medical Ltd is also registered with the General Pharmaceutical Council and the MHRA 'EU common logo' scheme. Please read our aims and objectives. For further details about how this service is regulated please see regulation page. Feedback and complaints can be made by sending a message in the 'My Account' area of the website. Complaints will be acknowledged within 2 working days and responded to in full within 20 days. We aim to provide a safe convenient way for people to look after themselves and improve their well-being. Dr Fox is owned and operated by Index Medical Ltd (company no. 06797903): Boyce's Building, 40-42 Regent Street, Clifton, Bristol BS8 4HU. Telephone 0117 2050198. The services of Dr Fox are provided under the terms and conditions. Dr Fox is a Trusted Shops accredited retailer meaning the company, website, and service have passed rigorous checks – read further information.